The hepadnaviral reverse transcriptase can synthesize DNA on its native RNA template within viral cores but it is usually unable to synthesize DNA employing exogenous nucleic acids as a template. The mechanism of this template commitment is unknown. Here we provide evidence that the RNAseH activity of duck hepatitis B virus reverse transcriptase may also be unable to act on exogenous substrates. RNAseH assays were performed under a wide variety of conditions employing substrate RNAs of Duck Hepatitis B Virus sequence annealed to complementary DNA oligonucleotides and permeabilized intracellular viral core particles. Temperature, pH, cation type, salt concentration, substrate concentration, and the sequences of the cleavage sites were varied, and the effects of ATP and dNTPs on RNAseH activity were examined. duck hepatitis B virus RNAseH activity was not detected under any of these conditions, although E. coli or Avian Myeloblastosis Virus RNAseH activity could be detected under all conditions. Access of the RNA substrate to the enzyme within the viral cores was confirmed. These results imply that the RNAseH activity of the DHBV reverse transcriptase may not be able to degrade exogenous RNA:DNA heteroduplexes, although it can degrade heteroduplexes of the same sequence generated during reverse transcription of the endogenous RNA template. Therefore, the RNAseH activity appears to be "substrate committed" in a manner similar to the template commitment observed for the DNA polymerase activity. Hepadnaviruses are small, enveloped hepatotropic viruses which replicate by reverse transcription of a pregenomic RNA molecule [1; for reviews see 2,3,4]. The replication of hepadnaviral DNA is initiated by the interaction of the viral reverse transcriptase (P) with an RNA stem-loop (∈) within a terminal duplication of the pregenomic RNA. P binds to the 5' copy of ∈ and then begins DNA synthesis, using a tyrosine residue near its own amino-terminus as a primer. DNA synthesis arrests after 3–4 nucleotides, and then the protein-linked nascent minus-strand DNA is transferred to the copy of direct repeat 1 (DR1) within the 3' terminal duplication. This nascent DNA then acts as a primer for the synthesis of full length minus-strand DNA templated by the pregenomic RNA [5,6,7,8,9,10]. During synthesis of the minus-strand DNA the pregenomic RNA is degraded by the ribonuclease H (RNAseH) activity of P. However, the RNAseH activity does not digest the extreme 5' end of the template RNA, and this ∼ 18 nucleotide capped RNA fragment is then transferred to direct repeat 2 (DR2), where it acts as a primer for synthesis of plus-strand DNA [11, 12]. The hepadnaviral P protein possesses many unique features relative to the better studied reverse transcriptases of the retroviruses: (i) it uses its own amino-terminal domain as a protein primer for initiation of DNA synthesis [7, 9, 10], (ii) it cannot be isolated in an active form from virions without partial proteolysis or denaturation [13,14,15], and (iii) under normal circumstances it is active only on the endogenous pregenomic RNA that is encapsidated with it in the viral cores . The mechanism of this template commitment is unknown, although the covalent linkage between P and the viral DNA is likely to contribute to it. RNAseH cleaves the RNA strand in a RNA:DNA heteroduplex, but it does not cleave DNA or RNA that is not hybridized to DNA. The RNAseH activity of P is required to remove the RNA pregenome after it has been copied into DNA during reverse transcription. If there is no RNAseH activity, positive polarity DNA cannot be synthesized and no infectious virions are produced. The hepadnaviral RNAseH activity has not yet been directly measured in viral core particles, however, its existence is inferred from four observations, (i) Sequence alignment of P with known RNAseH enzymes reveals conserved motifs in P [17,18,19,20]. (ii) Mutation of the putative RNAseH active site residues in both Hepatitis B Virus (HBV) and duck hepatitis B virus (DHBV) P blocks synthesis of mature hepadnaviral DNA and results in the expected RNA:DNA heteroduplex [19,21,22,23]. (iii) RNAseH activity has been detected for the human hepatitis B virus when the RNAseH domain was expressed as a fusion with the maltose binding protein . 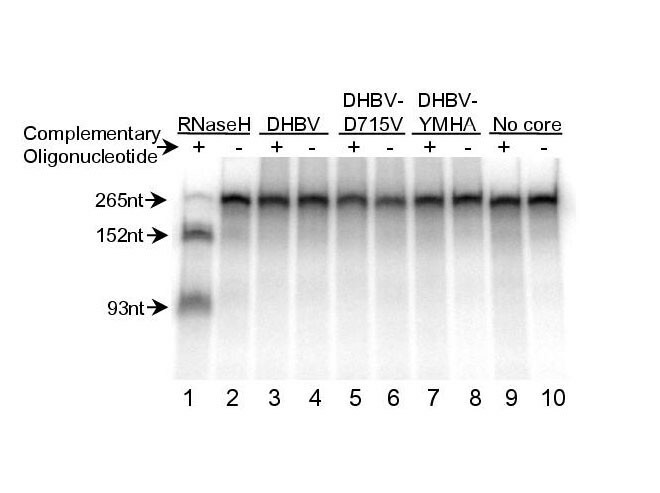 (iv) RNAseH activity has been detected in activity gels employing purified DHBV cores, but the apparent molecular weight of the RNAseH was less than that of the native DHBV P, indicating that P was either cleaved prior to the assay, or that the signal came from a cellular RNAseH . In this study we attempted to directly detect the RNAseH activity of DHBV P within viral cores employing exogenous substrates. Extensive efforts employing a wide range of conditions and substrates yielded no DHBV RNAseH activity. Because genetic and biochemical analyses indicate that P possesses an intrinsic RNAseH activity, we conclude that the hepadnaviral RNAseH activity is likely to be "substrate committed" in a manner similar to the template commitment observed for its DNA polymerase activity. To demonstrate that the DHBV P protein possesses an RNAseH activity that is active on RNA:DNA heteroduplexes generated during reverse transcription, we altered P amino acid 715 from aspartic acid to valine (D715V) within the RNAseH domain of P and examined the effect of this mutation on reverse transcription in viral core particles. Because no cell line exists that can be infected with DHBV, viral core particles were produced by transfection of DHBV DNAs into LMH cells (a chicken hepatoma cell line). LMH cells transfected with the appropriate expression vectors (e.g., D1.5G and its derivatives) produce core particles competent for reverse transcription and also secrete infectious virions . Viral DNA was purified from intracellular core particles by proteinase K digestion, phenol and chloroform extraction, and ethanol precipitation. The DNAs were then examined by Southern analysis using strand-specific RNAs as probes. Figure 1 shows the expected distribution of forms from cells transfected with wild-type DHBV DNA (lanes 2 and 6). As expected, transfection of cells with DHBV DNA carrying the YMHA polymerase active-site mutant ablated all DNA synthesis (lanes 4 and 8). Transfection of cells with DNA carrying the D715V mutation inhibited DNA synthesis during minus-strand DNA synthesis, yielding immature minus-polarity DNAs (lane 3), and it also ablated positive polarity DNA synthesis (lane 7). Analysis of the DNAs on denaturing gels revealed that the negative polarity DNA synthesized by the D715V mutant was annealed to a complementary strand , indicating that it was in an RNA:DNA heteroduplex. This is the predicted phenotype for an RNAseH-deficient hepadnaviral P protein, and it indicates that the P protein has an RNAseH activity that acts on endogenously synthesized RNA:DNA heteroduplexes. Mutating the DHBV P RNAseH domain yields an RNAseH deficient phenotype. DHBV viral cores were produced in LMH cells transfected with wild-type DHBV DNA or DHBV DNAs carrying mutations in the P gene (D715V in the RNAseH domain or YMHA in the reverse transcriptase domain). Viral DNA was isolated by proteinase K digestion, phenol and chloroform extraction, and ethanol precipitation. 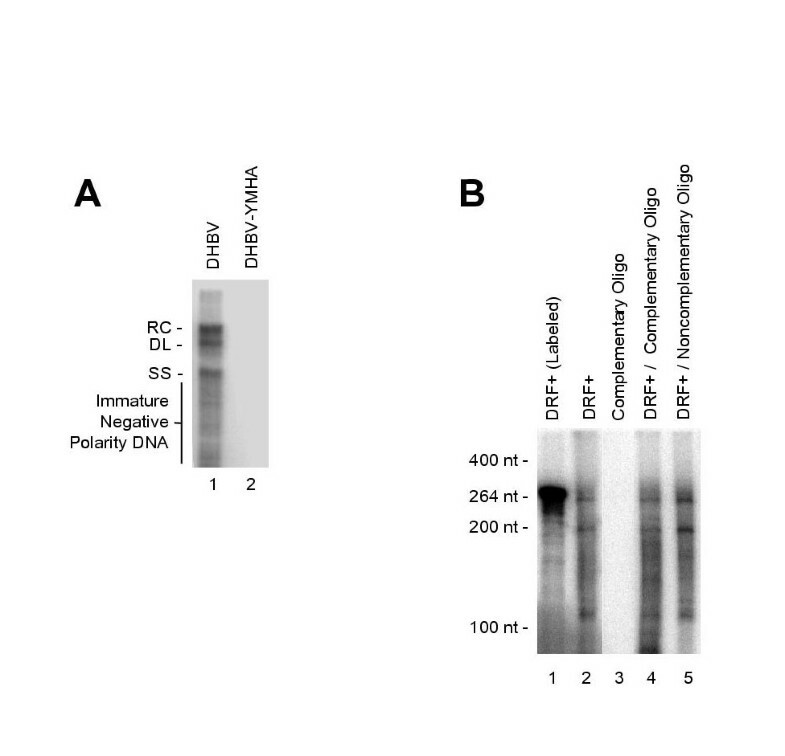 Viral DNAs were detected by Southern analysis with strand-specific riboprobes covering DHBV nt 170-3021; the left panel shows negative-polarity DHBV DNAs and the right panel shows positive polarity DNAs. DHBV monomer DNA is a 3021 bp EcoRI monomer of cloned DHBV DNA, RC DNA is mature relaxed circular DNA, DL DNA is duplex linear DNA, SS DNA is full-length single-stranded DNA. To examine DHBV RNAseH activity on exogenous substrates, internally 32P-labeled RNAs were synthesized in vitro and annealed to complementary DNA oligonucleotides. RNAseH activity was detected as cleavage of the RNA at the position of the hybridized oligonucleotide. The first region selected for this oligonucleotide-directed RNAseH assay was positive sense RNA derived from DHBV nt 2401 to 2605 (DRF+), which contains DR2, DR1, and the 5' half of ∈. This RNA was chosen as it contains the region where the DHBV RNAseH activity likely initiates during reverse transcription. Oligonucleotide D2507- was annealed to DRF+ RNA, and cleavage of this substrate by E. coli RNAseH yielded products of 152 nt and 93 nt (Fig. 2 lane 1). An overlapping oligonucleotide of positive polarity that cannot anneal to the DRF+ RNA (D2526+) was used as a negative control, and no cleavage of the RNA was detected under these conditions (lane 2). The detection limit of this assay was less than 0.00001 U E. coli RNAseH (data not shown). DHBV RNAseH activity is unable to act on exogenous substrates. Permeabilized DHBV core particles and core particles containing P mutants D715V and YMHA were used in the RNAseH assays, and the products were resolved on a 6% denaturing polyacrylamide gel. + indicates a complementary oligonucleotide was included in the reaction; - indicates that an oligonucleotide was the same polarity as the template was included in the reaction; RNAseH indicates E. coli RNAseH; 'No core' indicates the DHBV cores were omitted from the reaction. The sizes of the substrate (265 nt) and its cleavage products (152 nt and 93 nt) are marked with arrows. 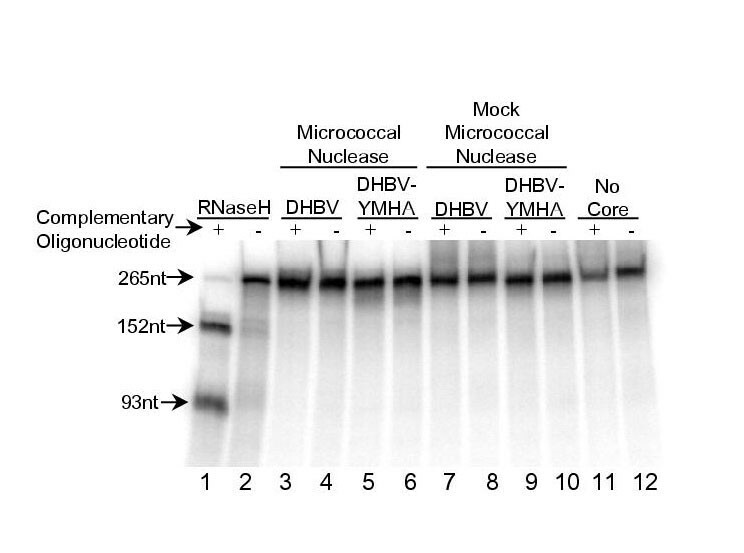 Viral cores prepared from LMH cells transfected with DHBV, DHBV-D715V, and DHBV-YMHA were employed with DRF+ RNA in the oligonucleotide-directed RNAseH assay in the first attempt to detect DHBV RNAseH activity on exogenous substrates. The DHBV sample contained 8 × 109 genome equivalents, as determined by slot-blot hybridization of core-derived nucleic acids. Because hepadnaviral core particles are impermeable to large molecules, they were treated with low pH prior to the RNAseH assays to allow the substrate access to P within the cores . No RNAseH activity was detected with the viral cores in reactions containing the complementary negative polarity oligonucleotide (Fig. 2, lanes 3, 5, 7). As expected, there was no cleavage in the negative control reactions employing the noncomplementary positive polarity oligonucleotide (lanes 4, 6, 8). Five controls were performed to ensure that these negative results were not artifacts. First, to ensure the presence of enzymatically active DHBV P, viral core particles were monitored for DNA polymerase activity on the endogenous nucleic acids within the core particles (the endogenous polymerase assay; Fig. 3A). Second, to limit the possibility that the failure to detect RNAseH activity was due to insufficient number of viral core particles, an RNAseH assay was performed with a 10-fold increase in cores. Again, no DHBV RNAseH activity was detected (data not shown). Third, permeabilization of the cores was monitored by treating an aliquot of the permeabilized cores with micrococcal nuclease and then measuring DNA synthesis by the endogenous polymerase assay. Micrococcal nuclease cannot gain access to the nucleic acids within unpermeabilized cores, and hence DNA synthesis would be unaffected if the permeabilization failed. However, DNA synthesis was ablated by micrococcal nuclease treatment of permeabilized cores, indicating that permeabilization was successful (data not shown). Fourth, to control for possible inactivation of the RNAseH active site by low pH treatment, cores were permeabilized by treatment with 1 M NaCl or 0.3%SDS/1% NP-40 , again without yielding detectable RNAseH activity (data not shown). Finally, the ability of the RNAseH substrate to access P within the viral cores was verified using the recently reported ability of DHBV P to synthesize limited amounts of DNA from an exogenous RNA following removal of the endogenous nucleic acids (the trans reaction ). The trans reaction is template-dependent reverse transcription of the exogenous RNA that does not depend on the protein-primed initiation mechanism of the hepadnaviruses . In the trans reaction the nucleic acids within permeabilized DHBV cores were degraded by micrococcal nuclease, and then the nuclease was inactivated by addition of EGTA. DRF+ RNA and radioactive dNTPs were added, the mixture was incubated at 37°C to allow DNA synthesis, and the products were purified and resolved by denaturing polyacrylamide electrophoresis. The results (Fig. 3B lane 2) showed that DNA was synthesized by core particles employing DRF+ as a template, indicating that the RNA had access to P within the particles. The complementary oligonucleotide D2507- did not support DNA synthesis (lane 3). The RNAseH substrate itself (DRF+ RNA annealed to D2507-) also supported DNA synthesis in the trans assay (lane 4), as did the combination of DRF+ RNA and the non-complementary oligonucleotide D2526+ (lane 5). The identity of the additional band at the bottom of Lane 4 that is absent from similar reactions lacking the complementary oligonucleotide (Lanes 2 and 5) is unknown. It is likely the result of an additional stop site for reverse transcription that is present when the oligonucleotide is bound to the RNA rather than extension from the oligonucleotide because we have never detected oligonucleotide-dependent priming with the DHBV polymerase under any conditions. The key feature of this important control is the detection of DNA synthesis using the RNAseH template as a substrate, because it directly demonstrates that the substrate employed in these experiments could access the polymerase within the permeabilized viral core particles. DHBV core particles contain enzymatically active P that can synthesize DNA employing the RNAseH substrates as templates. (A) Endogenous polymerase assay in permeabilized DHBV core particles. Viral cores were permeablized by brief treatment at pH 2.5. Following neutralization, the cores were incubated with [α-32P]dNTPs and then the viral DNAs were isolated by proteinase K digestion, phenol and chloroform extraction, and ethanol precipitation. DNA synthesized by P within the cores was separated on a 1.2% agarose gel and detected by autoradiography. Lane 1: wild-type DHBV cores; lane 2: polymerase mutant YMHA cores. RC: relaxed circular DNA; DL, duplex linear DNA; SS, single strand DNA. (B) Reverse transcriptase activity using the exogenous RNAseH substrate as a template (the trans-reaction). Viral cores were permeabilized and the endogenous nucleic acids were removed with micrococcal nuclease. The trans reaction was performed with the indicated exogenous nucleic acids. The products were purified by phenol and chloroform extraction and were resolved by denaturing polyacrylamide electrophoresis. Lane 1 contains internally 32P -labeled DRF+ RNA as a marker. Complementary Oligo, oligonulceotide D2507-; Noncomplementary Oligo, oligonucleotide D2526+. Lane 4 contains the RNAseH substrate (DRF+ RNA annealed to oligonucleotide D2507-). Sizes of single-stranded marker RNAs are indicated. The initial RNAseH assays were performed under conditions optimized for the reverse transcriptase activity of recombinant DHBV P . These conditions were chosen because the RNAseH and polymerase activities function coordinately during reverse transcription, and hence it is reasonable to assume they operate under similar conditions. However, because the initial assays failed to detect DHBV RNAseH activity, the oligonucleotide-directed RNAseH assay was performed with DHBV cores under a wide variety of conditions. We first employed conditions optimized for human immunodeficiency virus RNAseH . RNAseH activity was detected using E. coli RNAseH and AMV reverse transcriptase, but it was not detected with the DHBV cores (data not shown). We then varied the pH from 7.0 to 8.5; E. coli RNAseH was active at all pHs, but no cleavage was found in reactions containing the permeabilized cores (data not shown). Negative results for DHBV RNAseH activity were also obtained when the RNAseH assay was performed at NaCl concentrations ranging from 50–150 mM, although the E. coli RNAseH was active in all these conditions (data not shown). To examine the effect of divalent cation composition, 8 mM MnCl2, was used instead of 10 mM MgCl2, and again no RNAseH activity was detected (data not shown). We next examined cleavage with substrate amounts ranging from 50 ng to 5000 ng per reaction and with incubation times ranging from 1 h to 4 h. DHBV RNAseH cleavage was not detected under any of these conditions, although the E. coli RNAseH activity was detected in all of them (data not shown). Since the body temperature of Pekin ducks is about 42°C, an RNAseH assay was performed with DHBV cores at 42°C. Again, no RNAseH activity was observed (data not shown). ATP has been reported to increase the cleavage efficiency of RNAseH . Therefore, 1.5 mM ATP was included in an RNAseH assay. DHBV RNAseH cleavage was not detected within the cores under these conditions (data not shown). Similarly, inclusion of 40 μM each of the four dNTPs did not stimulate the RNAseH activity (data not shown). This suggests that (i) there is no obvious nucleotide requirement to activate the RNAseH activity, and (ii) any DNA synthesis that may have occurred on the substrates during the reaction (either primed by the oligonucleotide or produced by the trans reaction) was insufficient to induce detectable RNAseH activity. To detect DNA polymerization on exogenous RNA templates (the trans-reaction), the endogenous nucleic acids are first removed with micrococcal nuclease. To determine if a similar effect would be observed with the RNAseH activity, an RNAseH assay was performed in permeabilized cores in which the nucleic acids had been removed with micrococcal nuclease. The results (Fig. 4) showed that RNAseH activity was not detected in micrococcal nuclease treated cores (lanes 3 to 6). Because the ∈ RNA stem-loop induces a structural change in P that is required for DHBV DNA polymerase activity [27, 28], we examined the possibility that ∈ may activate the RNAseH activity in micrococcal nuclease treated cores. ∈ RNA was added in trans to micrococcal nuclease treated cores in the RNAseH assay, and again, DHBV RNAseH activity was not observed (data not shown). RNAseH assay using micrococcal nuclease treated cores after permeabilization. Wild type viral core particles (DHBV) or reverse transcriptase-activity deficient core particles (DHBV-YMHA) were permeabilized and the nucleic acids within the cores were either digested with micrococcal nuclease (lanes 3-6), or a mock micrococcal nuclease digestion was performed (lanes 7-10). + indicates a complementary oligonucleotide was included in the reaction; - indicates that the oligonucleotide was the same polarity as the template; RNAseH indicates E. coli RNAseH; 'No core' indicates the DHBV cores were omitted from the reaction. The sizes of the substrate (265 nt) and its cleavage products (152 nt and 93 nt) are marked. The above experiments suggest that the DHBV RNAseH may not be able to act on exogenous substrates. To exclude the possibility that the DHBV RNAseH simply could not recognize the specific heteroduplex formed by DRF+ RNA and oligonucleotide D2507-, a second pair oligonucleotides (D2453+ and D2543M-Sal) were employed with DRF+ RNA in oligonucleotide-directed RNAseH assays employing permeabilized DHBV core particles. Again, no DHBV RNAseH activity was observed with the viral cores under any condition employed, although E. coli RNAseH recognized the substrate under all conditions employed (data not shown). To determine if the lack of success was specific to the DRF+ RNA, a second RNA, DXB+ (DHBV nt 1358–1504 positive polarity), annealed to the complementary oligonucleotide D1452- was employed in RNAseH assays. Again, no specific DHBV RNAseH cleavage was observed (data not shown), indicating that using different region of RNA from the DHBV genome did not affect the observation that the DHBV RNAseH could not engage an exogenous substrate. Because the micrococcal nuclease-treated cores may represent the best likelihood of observing RNAseH activity, a titration of the substrate was performed employing 50 to 500 ng DXB+ RNA annealed to D1452- and nuclease-treated DHBV core particles. Again, no DHBV-specific cleavages were observed (data not shown). Other assays to detect DHBV RNAseH activity were also employed. Randomly initiated RNA synthesis by E. coli RNA polymerase was used to make [32P]RNA:DNA substrates using synthetic homopolymers or DRF DNA . In these assays, RNAseH activity is measured as a reduction in TCA-precipitable radioactivity. No viral RNAseH activity was detected in experiments with DHBV cores, supporting the observation obtained with the oligonucleotide-directed RNAseH assay (data not shown). 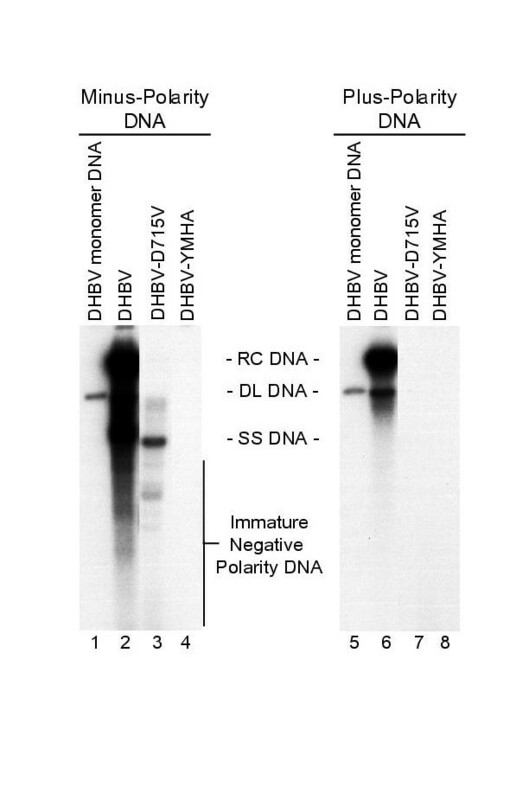 Two different sources of recombinant, enzymatically active DHBV P were also employed in the RNAseH assays without success. DHBV P with reverse transcriptase activity can be produced in yeast within recombinant TY retrotransposnon particles as a fusion with yeast retrotransposon TY-A protein . DHBV RNAseH activity could not be detected using yeast-derived recombinant P in either the oligonucleotide-directed RNAseH assay or the synthetic homopolymer assay, although RNAseH activity of the wild-type TY retrotransposon particles could be detected (data not shown). DHBV RNAseH activity also could not be detected with P translated in vitro in rabbit reticulocyte lysates, although P expressed in this system possesses reverse transcriptase activity . The hepadnaviral DNA polymerase activity is strongly associated with the viral core structure and is normally unable to synthesize DNA from an exogenous template . The aim of this study was to determine if the DHBV RNAseH activity was similarly restricted to the endogenous heteroduplex substrate generated during reverse transcription. Oligonucleotide-directed RNAseH assays were performed with permeabilized viral cores under a wide variety of conditions. Temperature, pH, cation composition, salt concentration, substrate concentration, and inclusion of ATP and dNTPs were examined. RNAseH assays were also carried out after removal of the endogenous nucleic acid, and multiple RNA sequences and DNA oligonucleotide combinations were employed. DHBV RNAseH activity was not detected under any of these conditions, although E. coli or AMV RNAseH activity could easily be detected under all of them. Control experiments demonstrated that (i) the cores were permeabilized because the viral nucleic acids were sensitive to micrococcal nuclease following low pH treatment; (ii) the RNAseH substrate could access the polymerase within the viral cores as determined by the trans reaction (Fig. 3B); (iii) the DNA polymerase activity of the P survived the low pH treatment, as measured by synthesis of viral DNA; and (iv) the RNAseH substrates were suitable because they were degraded by E. coli RNAseH and AMV reverse transcriptase and because the DHBV RNAseH activity can degrade these RNA sequences during reverse transcription (the target RNAs were derived from the DHBV genome). However, the DHBV RNAseH activity could not degrade the same sequences when they were presented as exogenous heteroduplexes. Therefore, we feel the RNAseH activity is likely to be "substrate committed" in a manner analogous to the template commitment of the DNA polymerase activity. This conclusion is subject to a number of caveats because it rests on negative data (i.e., the failure to detect RNAseH activity). There are at least three other potential causes for the failure to detect RNAseH activity that we cannot formally exclude. The first possible cause is that the RNAseH activity in our core preparations may be too low to detect. To evaluate this possibility, it is useful to compare the enzymatic turnover number for the polymerase activity in the trans reaction with the turnover number for the RNAseH activity that would be needed to reach the detection limit in our assays. Phosphorimage analysis of the radioactivity incorporated in a trans reaction employing 1.2 × 109 core particles (quantitated as genome-equivalents of viral DNA by slot-blot hybridization) indicated that about 4.8 × 1010 nucleotides were incorporated into DNA in the reaction. Assuming one polymerase molecule per core particle, this gives a turnover rate of about 40 nucleotides per polymerase molecule in the trans reaction. To maximize the possibility of detecting RNAseH cleavage products, each RNAseH assay was exposed to film for up to a week to "burn out" the signal from the cleavage products that migrate below the input RNA on the gels. Under these conditions, our detection limit for the RNAseH assay was measured at 0.625 pg of internally 32P-labeled RNA, or about 7.5 × 106 molecules of the 152 nt cleavage product. To reach this detection limit with the 8 × 109 polymerase molecules used in a typical RNAseH assay would require just a single catalytic cycle from 0.094% of the polymerase molecules in the reaction. Therefore, the turnover number for the RNAseH activity needed to reach the detection limit in our assays is about 43,000-fold less than the 40 cycles observed for the polymerase activity under very similar conditions. This huge difference gives us confidence that our assays were sensitive enough to detect RNAseH activity if it were present. The second alternative cause for our failure to detect RNAseH activity is that the RNAseH active site may be sterically blocked in core particles. However, recombinant P translated in vitro has reverse transcriptase activity outside core particles, yet P expressed in this manner was still unable to degrade the exogenous RNAseH substrates. Furthermore, the DNA polymerase active site in permeabilized core particles is accessible to the exogenous RNAseH substrates (Fig. 3B). The RNAseH active site must be in very close proximity to the polymerase site and be oriented in such a manner that it can access heteroduplexes within ∼ 18 base pairs of the 3' end of the growing DNA chain, and hence steric occlusion seems to be unlikely. The third alternative explanation for our negative data is that the DHBV RNAseH activity may have been inactivated by the low pH pulse used to permeabilize the cores. To control for this possibility, we employed three different permeabilization methods (low pH, high salt, and detergent). None of these conditions inactivated the DNA polymerase activity, yet we were unable to detect RNAseH activity in cores permeabilized by any of these methods. Furthermore, DHBV RNAseH activity could not be detected with recombinant P-TY particles purified from yeast, although TY RNAseH activity could be detected from non-recombinant TY particles. TY particles are naturally porous and do not require permeabilization for access of substrate. This allowed us to assay enzymatically active recombinant DHBV polymerase for RNAseH activity on exogenous substrates without permeabilization. Together, these extensive controls lead us to believe that the simplest explanation of our data, e.g. that the RNAseH activity is substrate committed, is most probably correct. The two enzymatic active sites of DHBV P are likely to interact with the viral nucleic acids through a single binding interaction because they are very close to each other and because other reverse transcriptases (such as that of HIV) bind to the RNA:DNA heteroduplex as a single protein entity . Therefore, our data imply that the template/substrate commitment of the DHBV reverse transcriptase may be a feature of that common interaction rather than a feature of the polymerase active site alone. This hypothesis is consistent with the recent production of enzymatically active HBV RNAseH as a fusion protein in E. coli  because the fusion protein did not contain the polymerase domain and it was not substrate committed. Because one biochemical feature (e.g., substrate commitment) of this recombinant HBV RNAseH enzyme may be altered relative to the properties of the native enzyme, the possibility that other biochemical parameters of the recombinant enzyme may differ from those of the native enzyme should be considered. The molecular mechanism of this probable template/substrate commitment is unclear. We speculate that the covalent linkage of the viral DNA to P or an unusually tight association between P and the viral nucleic acids may contribute to the commitment. However, this cannot entirely account for the substrate commitment because removal of endogenous nucleic acid with micrococcal nuclease only partially relieves the template commitment of the DNA polymerase activity and it did not relieve the apparent restriction on the RNAseH activity. Understanding the mechanism of the template/substrate commitment of the hepadnaviral reverse transcriptase may need to wait until a three-dimensional structure of the polymerase bound to a nucleic acid primer-template is obtained. DHBV RNAseH activity could be detected on RNA:DNA heteroduplexes synthesized within DHBV core particles in the process of viral reverse transcription, but no RNAseH activity could be detected exogenously provided RNA:DNA heteroduplexes. Extensive controls lead us to believe that the RNAseH active site is most probably "substrate committed" in a manner similar to the "template commitment" of the reverse transcriptase activity. We acknowledge that we have not formally proven this conclusion, but at a minimum, we have demonstrated that the DHBV RNAseH activity cannot degrade exogenous substrates under a very wide variety of conditions that support vigorous activity by the associated DNA polymerase domain. The vims employed in this study was duck hepatitis B Virus Type 3 (DHBV3; ). The vector for all constructs was pBluescript(-) (Stratagene). D1.5G is an overlength wild-type DHBV3 expression construct that contains a 5' duplication of nt 1658 to 3021. D1.5G-D715V and D1.5G-YMHA are mutant derivatives of D1.5G. D1.5G-D715V contains a mutation that alters P amino acid 715D to V; this alteration ablates the RNAseH activity . D1.5G-YMHA contains mutations in the reverse transcriptase motif YMDD of P (D513H and D514A) that ablate DNA polymerization . pDRF contains DHBV nt 2401 to 2605. pDXB contains DHBV nt 1358 to 2662. Three pairs of complementary oligonucleotides were used in this study. The D2526+/D2507- and D2453+/D2543M-Sal pairs were used with DRF+ RNA, and the D1433+/ D1452- pair was used with DXB+ RNA. The sequences of the oligonucleotides are: D2526+ (CCACATAGGCTATGTGGAAC), D2507-(GTTCCACATAGCCTATGTGG), D2453+ (CCGCCTGATTGG ACGGCTTTTCC),D2543M-Sal (GCAACTGTGTCGACAGCAGCTCCGAAGGAGA), D1433+ (CCAAGATACTGGAGCCCAAA), and D1452- (TTTGGGCTCCAGTATCTTGG). LMH cells were transfected by calcium phosphate coprecipitation as described previously , and viral cores were isolated 3 days post-transfection. The transfected cells were lysed in 1 ml lysis buffer [10 mM Tris-HCl (pH 7.5), 1 mM EDTA, 0.25% Nonidet P-40, 50 mM NaCl, 8% sucrose] per 100 mm plate at 37°C for 10 min. The cell lysate was clarified at 13,000×g for 5 min and digested with 100 units micrococcal nuclease (Roche) for 45 min at 37°C in the presence of 10 mM CaCl2. Digestion was stopped by addition of EDTA to 15 mM, and then the lysate was clarified again by centrifugation at 13,000×g for 5 min. The supernatant was layered on a 30% sucrose cushion and centrifuged at 245,000×g for 2 h at 4°C. The pellet was resuspended in 50 μl B/EDTA/sucrose (10 mM HEPES pH 7.8, 15 mM KCl, 5 mM EDTA, 5% sucrose) and stored at -75°C. Viral cores were permeabilized by a 30 second treatment at pH 2.5 as described . For mock permeabilization of cores, the glycine and Tris-HCl used to lower the pH and to neutralize the solution during permeabilization were mixed together prior to addition to core particles. pDRF and pDXB were used for the production of internally 32P -labeled RNA substrates by in vitro transcription with the appropriate Megascript kit (Ambion) with addition of 20 μCi [α32P]UTP (Amersham). pDRF was linearized with EcoRI and transcribed by T3 RNA polymerase; the resulting RNA was 265nt long with positive polarity. pDXB was linearized with AvaII and was transcribed with T7 RNA polymerase; the resulting RNA was 182 nt long with positive polarity. Following the transcription, the DNA templates were digested with DNaseI. RNA transcripts were gel purified by resolving them on 6% denaturing PAGE, excising them, and eluting them in a buffer containing 0.5 M ammonium acetate, 1 mM EDTA and 0.1%SDS overnight prior to phenol extraction and ethanol precipitation. RNAseH activity in permeabilized cores was measured by oligonucleotide-directed cleavage of internally 32P-labeled RNA substrates. The reaction was performed in endogenous polymerase buffer (50 mM Tris-HCl pH 8.0, 100 mM NaCl, 0.1% NP-40, 10 mM MgCl2 2.5% 2-mercaptoethanol) with 1 μg oligonucleotide, 100 ng purified radiolabeled RNA template, and 4 U RNasin at 37°C for 65 min. The products were resolved by electrophoresis, and detected by phosphorimage analysis (Molecular Dynamics). In some cases, 50 mM Tris-HCl pH 8.0, 2 mM DTT, 100 μg/ml BSA, 50 mM KCl and 8 mM MgCl2 was used (retroviral reverse transcriptase buffer ). E. coli RNAseH (0.5 U; Promega) was used as a positive control. Reverse transcriptase activity in viral cores was assayed by incubating cores in endogenous polymerase buffer with 40 μM dATP, dCTP, dTTP and 2 μCi [α32P]dGTP (Amersham) at 37°C for 90 min. The mixture was digested with 400 μg/ml proteinase K in the presence of 1% SDS for 2 h at 37°C. After phenol and chloroform extraction, the DNA was precipitated with ethanol, resolved on a 1.2% agarose gel and detected by autoradiography. Reverse transcriptase activity using an exogenous RNA template was measured as described previously [27, 28]. Nucleic acids within permeabilized cores were digested with micrococcal nuclease in the presence of CaCl2 Micrococcal nuclease was inactivated by addition of EGTA, 1.5 μg RNA was added, and the reaction was performed under conditions described for the endogenous polymerase reaction. Reactions were stopped by phenol and chloroform extraction, and the nucleic acids were precipitated with ethanol. The samples were resolved in 6% denaturing polyacrylamide gels and detected by phosphorimage analysis. For mock micrococcal nuclease treatment, the CaCl2 micrococcal nuclease and EGTA were mixed prior to addition to the permeabilized cores. This work was supported by NIH grant AI38447, American Cancer Society grant JFRA-616 and a Young Investigator Matching grant to J.T. from the National Foundation for Infectious Diseases.